The age of sail has passed but the romance lives on. If this needed confirmetion, a voyage on a square-rigger around the top of Australia, from Cairns to Thursday Island with a steady southeast trade wind, a brilliant star-studded sky and a Youthful crew would suffice. 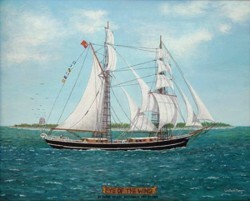 There were 24 of us on board the brigantine Eye of the Wind, 13 crew and 11 "guests". The 150-tonne, 40-metre long ship set sail from Cairns on a November morning, as several men and a young woman from Cumbria in bathing suit and sarong scampered aloft. She ran like a dancer along a footrope and we on deck below exulted as two topsails and the top gallant on the fore and main masts, and the nock staysail were set. Then came the lovely quietness as the engine was turned off and the ship rose sweetly on the ocean swells and we embarked on the course north for Cape Tribulation and Cooktown. 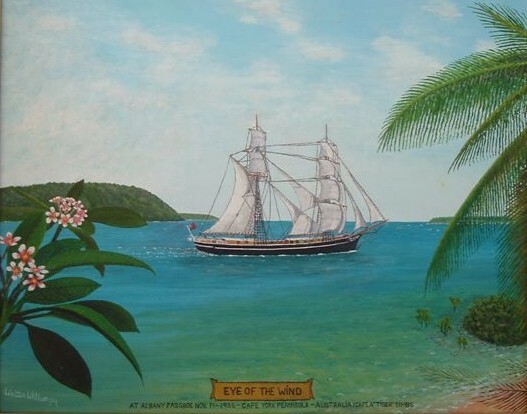 This was the first voyage for the Eye of the Wind in the Coral Sea and indeed we were following Cook, Flinders and Bligh in at least a similar sealane. It was new territory for the ship for she was built in Germany in 1911, had once been a topsail schooner carrying cargo across the Atlantic, later used by a Swedish family trading in the Baltic Sea. Purchased in Gothenburg in 1973 by five friends, her new owners had completely refurbished her into a sturdy, timeless, sailing vessel. Under the supervision of part-owner, soft-spoken Leslie, the Purser as she called herself, the "housekeeping" was exemplary. 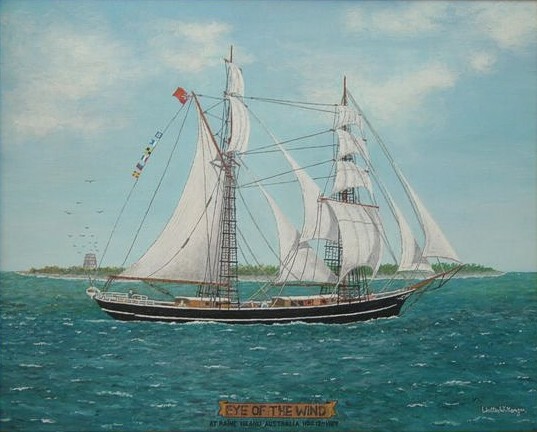 The Eye of the Wind had been Leslie's home for nine years and had become the home of many young English, Australians, Americans, and New Zealanders. We were assigned to watches right away and given a short talk on squarerigger sailing by Mate Tim and given a copy of the ship's rigging. At first glance the array of ropes and belaying pins is bewildering and some of us never understood about buntlines and clewlines and downhauls. But Big or Little Tim were always there saying "Let go that", "Pull that", someone was allowing us to have the experience we had travelled so far to gain. Walter, a Boeing man, had come on vacation from Seattle with his movie Camera and his girl-friend Dolores. He was intent on making a film of anything that had any remote connection with Cook. IT IS A strange feeling to anchor at night off the arid shore of the Cape York Peninsula. "The country is well clothed." wrote Cook, "and has at least the appearance of fertility." But it is an enormous scrub-covered emptiness, except for the lights near shore of sheltering prawn trawlers. We set sail al first light for Lizard Island and dropped anchor before mid-day beneath its Scottish-looking granite slopes. We swam on the marvelous beach near the resort and walked the two kilometres on the earth track through the goanna-ridden scrub to see the Marine Research Station in action. The voyage seemed to go from good to better. We had a day on the outer reef for the scuba divers and there were two evenings of beach barbecues of spanish mackerel caught on board, huge fish cut into steaks and marinated. Feast in remote coves with every adjunct carried from ship to shore provided a memory of lapping water and sunsets. There was a day when we landed on Stanley Island in the Flinders Group to walk through the kapok trees to climb to a cave of Aboriginal paintings. There was an evening and night on the great rookery of Raine Island when in the dusk we walked within inches of the nesting red-footed and masked booby birds there in thousands. At night we went back to sit on the beach to watch at the dark form of a turtle came out of the sea, to labor up the beach and commence to dig with intricate care and a stylish movement of the flippers the deep hole where, if she is satisfied with it, the turtle will lay her eggs. It is amazing to peer down at the 100 to 200 luminous eggs the size of ping pong balls and watch the huge creature swish the sand over them. 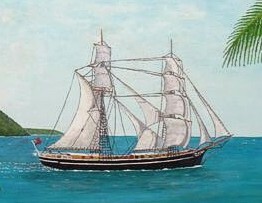 We went home to the brigantine climbing the rope ladder over the side again to sail the next day out the narrow exit from the reef to the open sea. Over there both to starboard and port is light green water beating down on the almost encircling coral beaches, but in full sail we traverse the dark-blue whirlpools through the deep-water passage to spend the night in the safety of the open ocean. On our second last day we anchored it the Albany Passage to spend the morning at the abandoned Japanese Albany Island pearling station now safeguarded only by the lone Torres Strait Islander Benny. It is such a beautiful place of pink hibiscus, white sand, mangroves and empty plastic baskets. In the afternoon, we crossed to the south to visit the site of Somerset House where the Jardines had lived and where once every ship proceeding into Tortes Strait had been obliged to stop. On our last morning we went ashore to walk on Cape York, a peninsula closely hemmed in with islands. From there we could look back down the Albany Passage to see the meeting of the Coral and the Arafura seas and thus the Pacific and Indian Oceans. This voyage had extraordinary ingrediets that meshed well together. I recommend this adventure holiday. For those seeking The Eye of the Wind's 1986 Pacific schedule it can be obtained from Peregrine Expeditions, 7'th floor, 343 Little Collins Street, Melbourne. Walter's travel report- film of the journey!